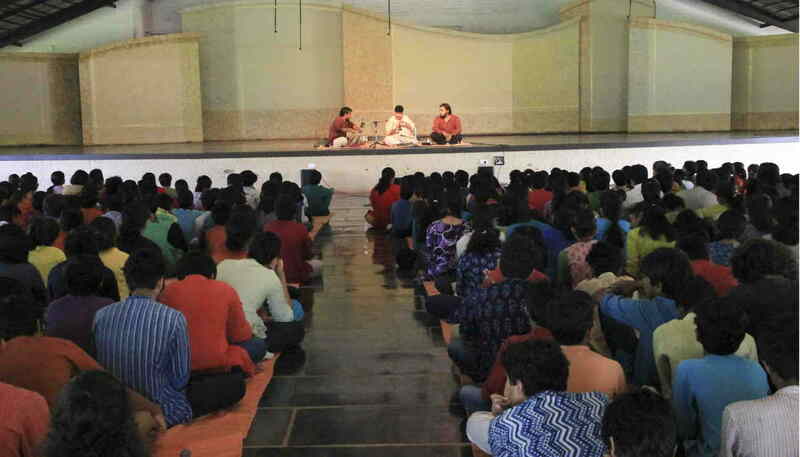 The audience at Isha Home School had a delightful visual experience on the morning of 4 August. 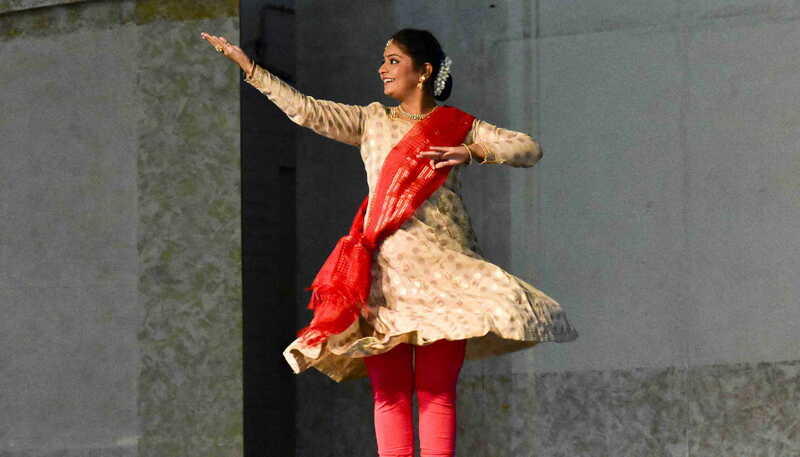 A dance duo from Mumbai enthralled the students and teachers alike with their skilful Kathak performance. 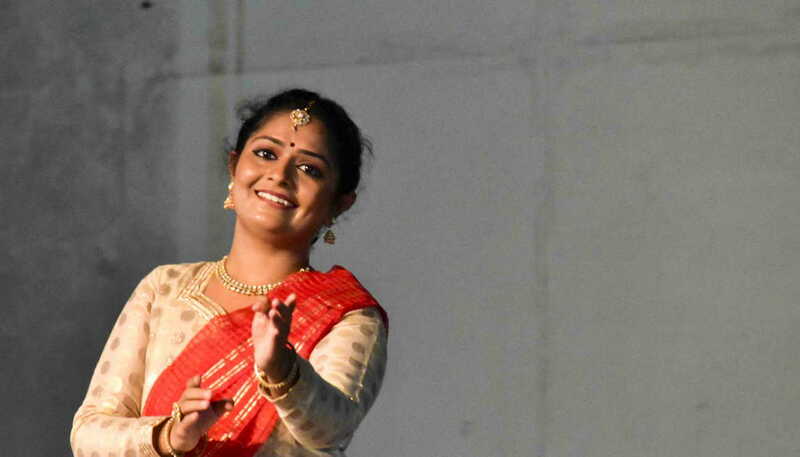 Esha, a young professional theatre artist who has more than 400 Marathi and Hindi stage shows to her credit and Vishakha, a trained interior designer, have been persuing classical Kathak Dance of Banaras Gharana as their passion for more than 15 years. Starting the presentation with a small introduction on the origin of Kathak, Esha performed a Krishnavandana, salutations to Lord Krishna. 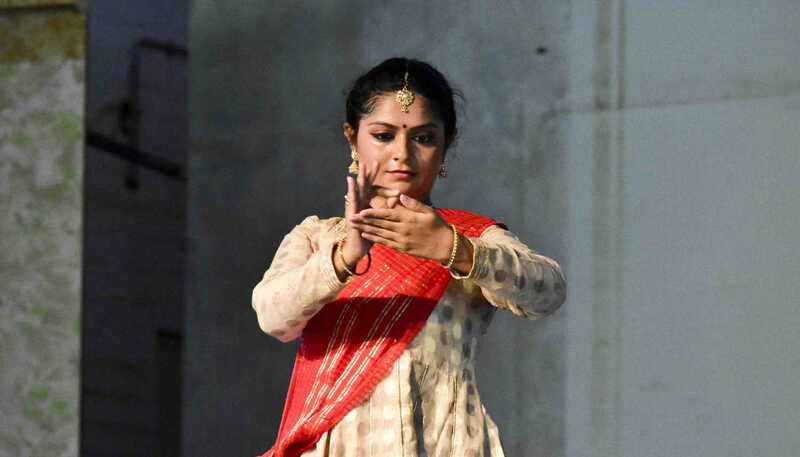 It was followed by a presentation of Teen Taal which included That, Amad, Paran etc as per the tradition of Kathak. 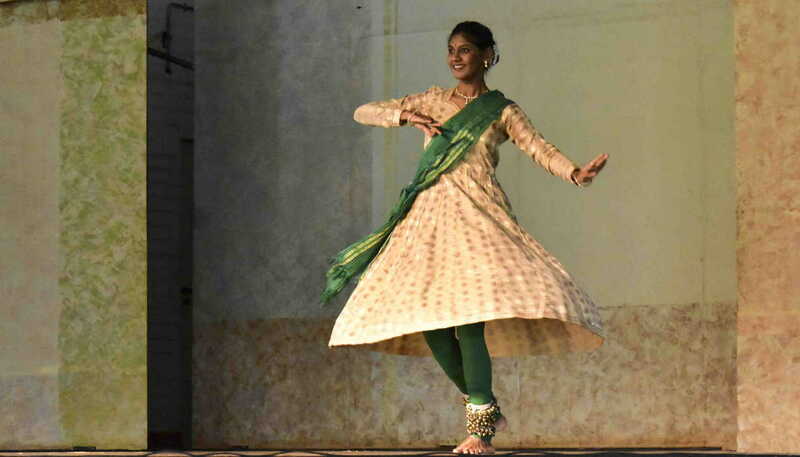 Excellent footwork and amazing composition of chakkars (spins) were greatly enjoyed by the audience. Vishakha performed a fast beat Tarana with wonderful footwork. 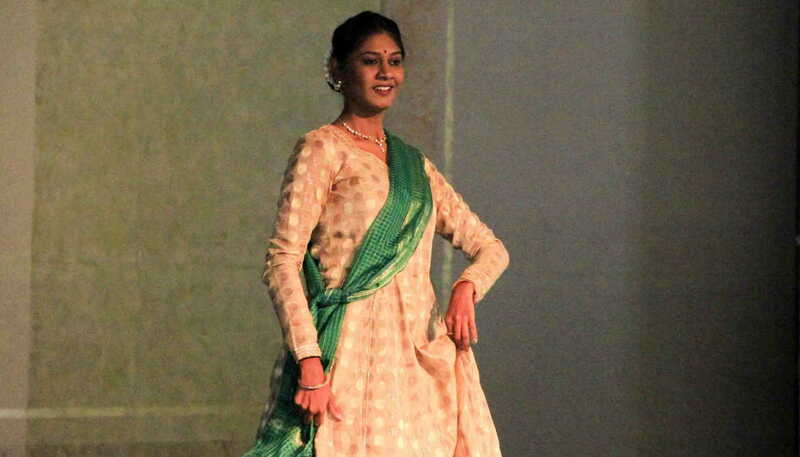 Esha concluded the program with a piece of Nritya/Abhinaya. 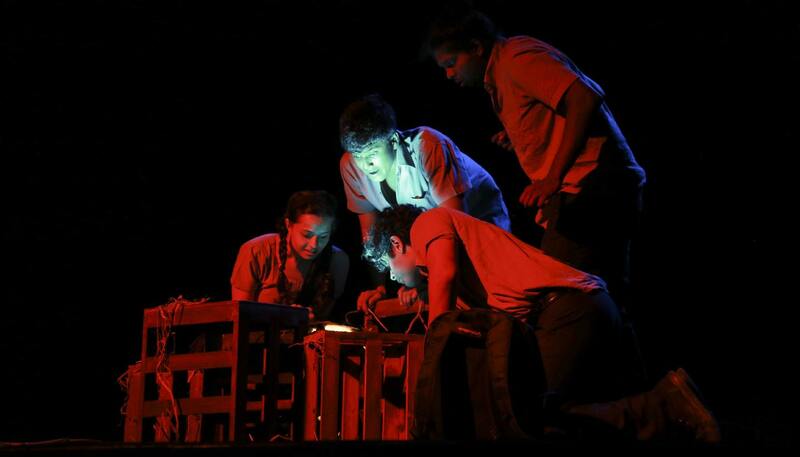 The various moods of the Nayika (Heroine) were portrayed with great skill and exuberance. 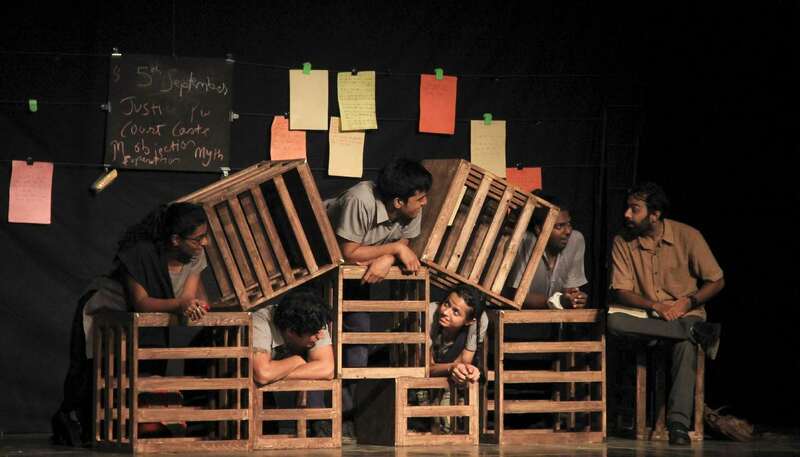 Both the artists also are currently conducting a dance workshop with the junior school. On the 25th of July, we were treated to a very melodic treat by Dr. Pramod Prabhashankar Gaikwad, one of India’s leading Shehnai players. Shri Gaikwad comes from a family that has played this auspicious instrument that is played in temples and at weddings for the past few generations. He presented two short but energetic pieces. The first one was based on the Raag Bhairagi and a prayer to Lord Shiva. 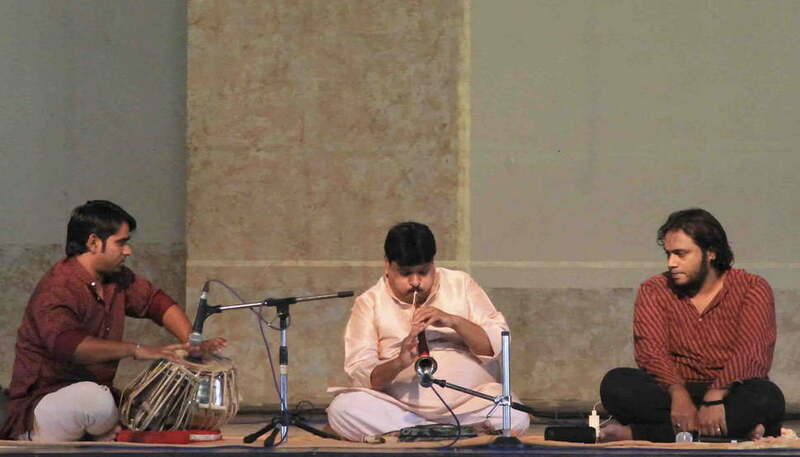 Accompanying him on stage were our in-house music teachers, Shri Praveen Mishra and Shri Mark John. The audience thoroughly enjoyed the concert and were amazed at how this short piece of wood could produce such melody. 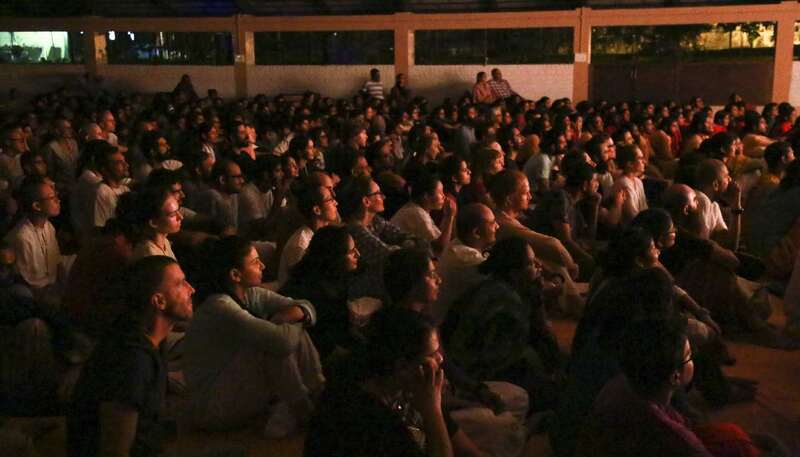 At the end of the concert, Shri Gaikwad mentioned that he felt very fulfilled playing to such an involved audience. 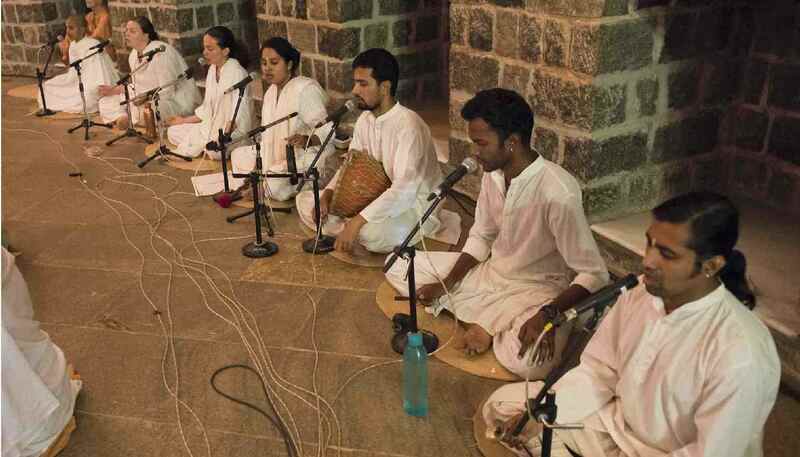 24-Jun: Interested students were given the opportunity to attend the 18th Anniversary Dhyanalinga Consecration celebrations held at the Isha Yoga Center. The program featured traditional chants from various cultures and religions. 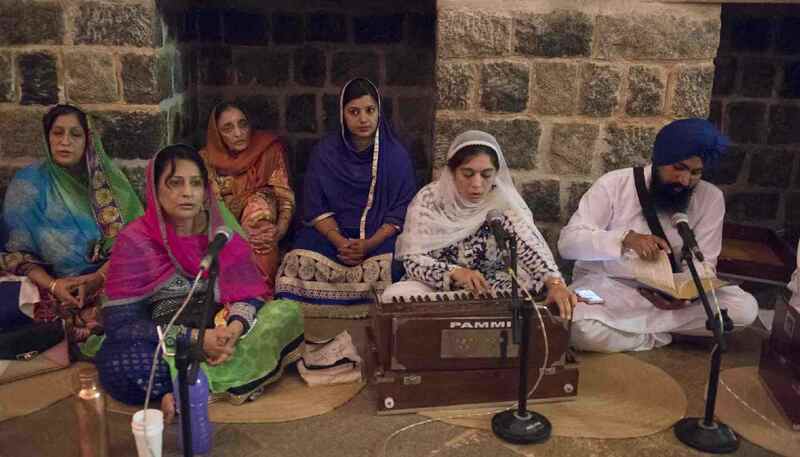 A special assembly was held, during which time volunteers and residents from the ashram presented Sufi and Christian chants. 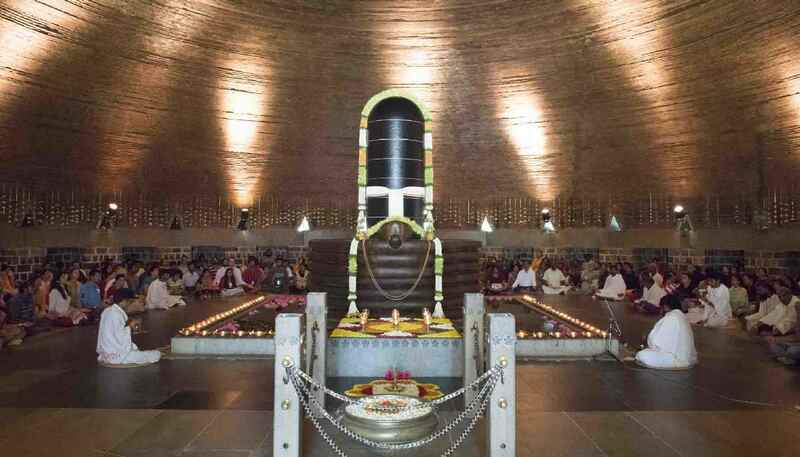 Students also learned about the symbols inscribed on the Sarva Dharma Sthambha, the pillar located at the front entrance, which functions as an icon of singularity and universal welcome. 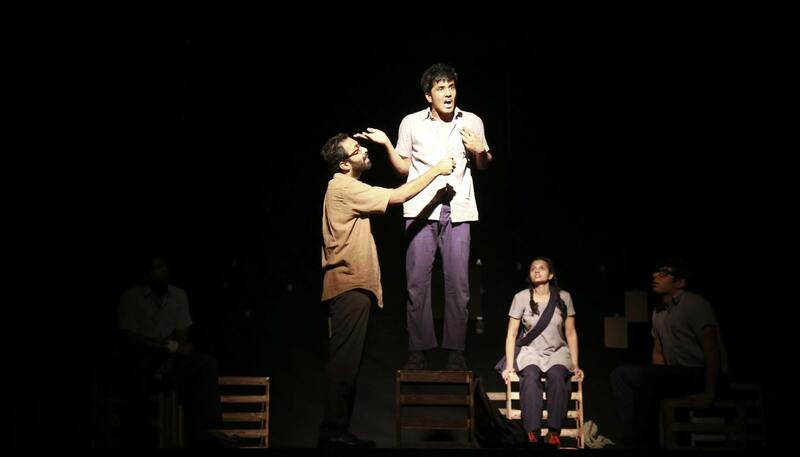 21-Jun: अंतर्राष्ट्रीय योग दिवस मुबारक! (Antarāṣṭrīya Yog Divas Mubaarak!) 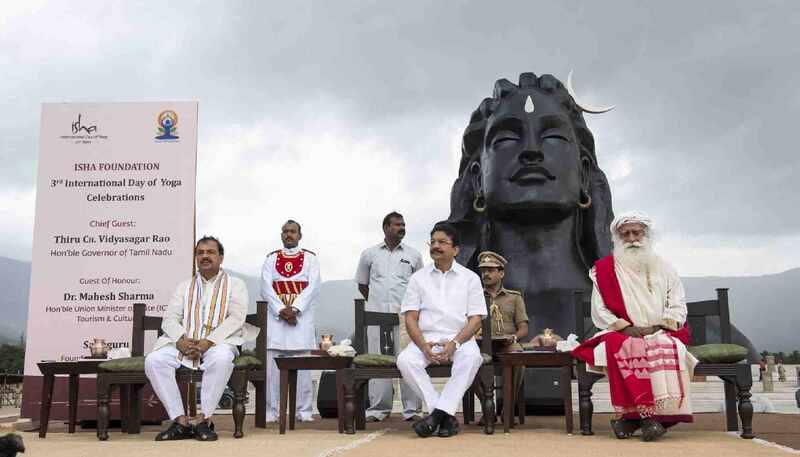 On the occasion of International Day of Yoga, IHS participated in the Isha Foundation’s IDY celebrations in the presence of Adiyogi at Isha Yoga Center. All assembled in the early morning hours against the backdrop of the magnificent Velliangiri foothills. 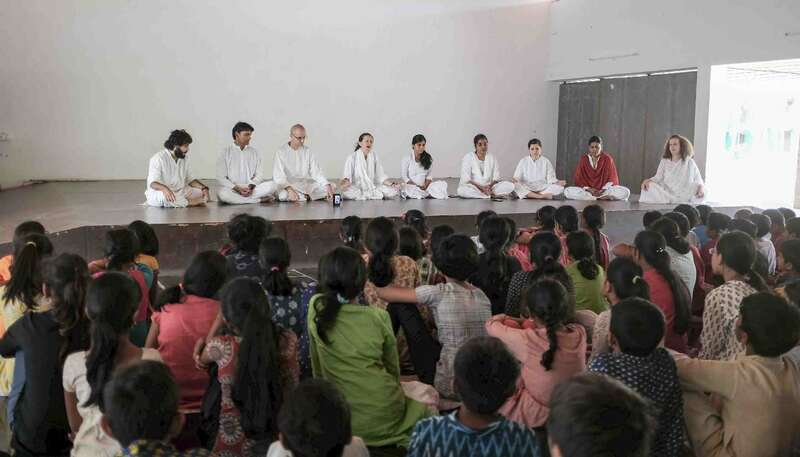 The assemblage consisted of students from various schools, members of the Border Security Force and other guests and residents of the Isha Yoga Center. 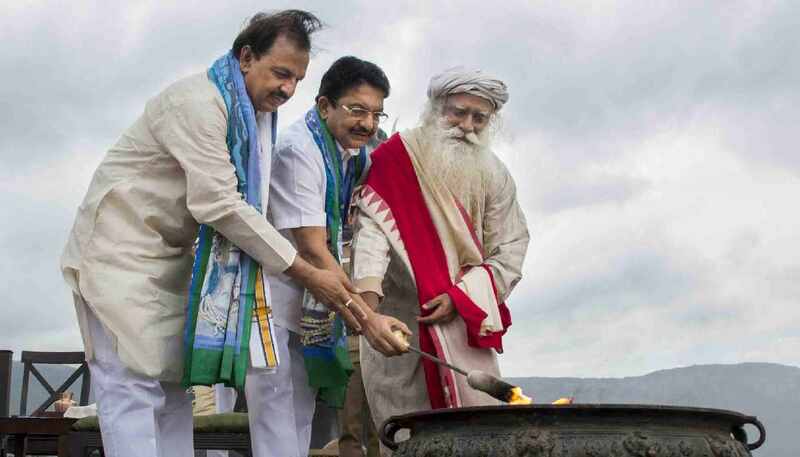 Sadhguru, the Guest of Honour, the Honourable Union Minister of State (IC), Tourism & Culture Dr. Mahesh Sharma, and the Chief Guest, the Honourable Governor of Tamil Nadu, Shri Ch. 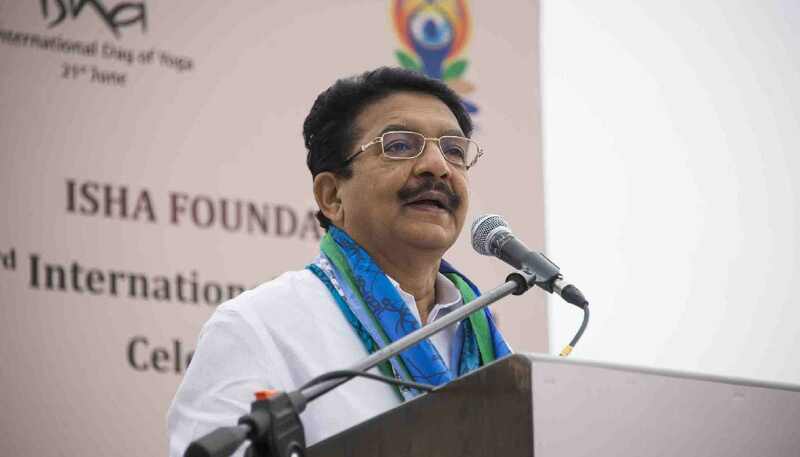 Vidyasagar Rao addressed the gathering. 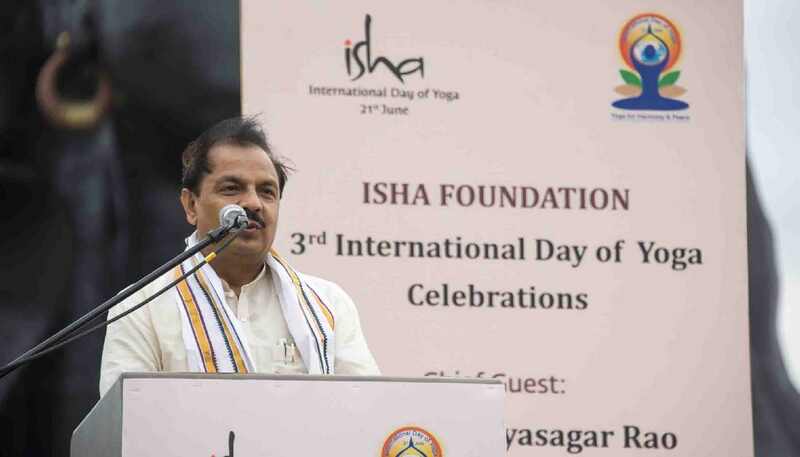 After the lighting of the Yoga Yagna, volunteers from the Isha Yoga Center taught simple yogic practices, namely Yoga Namaskar and Nadi Shuddhi.